Althea Scheller, center, is pictured on May 3 at Suffield by the River with proprietor Celia Moffie and the three members of the residence’s staff to whom she awarded scholarships. From the left: Jordyn Isabelle, Ansha Siawor, Mrs. Scheller, Moffie, and Kelly McInstrey. “If it weren’t for the excellent care they’ve given me, I don’t think I’d be walking,” Althea Scheller said. Sister of the late Ro Whitney of Suffield, Althea was gratified to have settled at Suffield by the River last summer near family members. She grew up in Hampden, Mass., and Suffield felt like home territory to Althea. Not long after moving from New Jersey, Althea had a bad fall. Following hospitalization and rehab, she received outstanding care at Suffield by the River (SBTR). In appreciation, Althea has given a $500 scholarship to three SBTR staff members. At a special ceremony on May 3, SBTR Owner-Director Celia Moffie awarded M. Althea Scheller Scholarships to Jordyn Isabelle, Kelly McKinstry and Ansha Siawor. 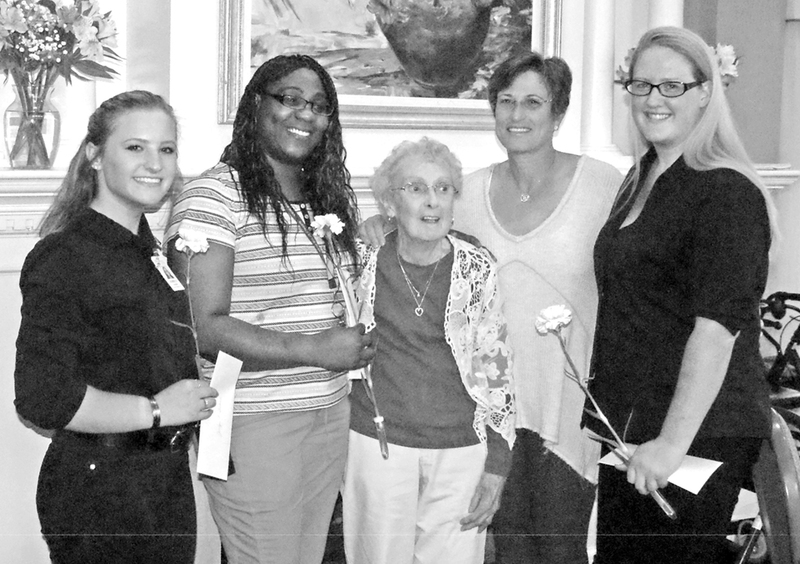 Althea Scheller congratulated and thanked each of the three, presenting them with flowers. Their credentials inspire! Recipient Ansha Siawor is a Licensed Practical Nurse at Suffield by the River. She attends Goodwin College, where she will be graduating in August, as a Registered Nurse. Ansha believes that being a team member at Suffield by the River provides her with the work ethic of a steadfast professional. She plans to continue working in eldercare at Suffield by the River while going on to earn her Bachelor’s degree in Nursing. Ansha clearly enjoys her care career. Jordyn Isabelle has a happy history of working and playing at SBTR. Her mother and aunt have worked there since 1998, and Jordyn has often come with them to attend and prepare residents’ parties. Jordyn has danced with residents at parties, done a gymnastics presentation and shared her dog Bella as a pet therapist. Jordyn will be graduating in June from Enfield High School and will attend Lasell College in Newton, Mass., to study psychology. Life has prepared her well for her career goal of working in the elderly health care field. Kelly McInstry wrote, “I have always loved being around the elderly.” Nine years old when she began occasionally accompanying her mother to work at SBTR, she played cards with residents and told them stories. At 16, Kelly took jobs in the kitchen and in recreation. She works 16 to 23 hours a week at SBTR and studies 14 hours a week at Asnuntuck Community College. Kelly says that her busy schedule has taught her to work more efficiently and enabled her to pay out-of-pocket for her education. Especially interested in Alzheimer’s and other dementias, Kelly will be debt-free when she earns her bachelor’s degree in a branch of geriatrics. In their love for their work, Ansha, Jordyn and Kelly do honor to their M. Althea Scheller Scholarships.